Long-time readers of this website will be aware that I’m passionate about redeeming points for accommodation, and I’m a longtime fan of the Starwood Preferred Guest program, which has now been merged into Marriott Bonvoy. Al Maha, a Luxury Collection Desert Resort & Spa, Dubai is one of the jewels in the crown of Marriott hotels chain. Featuring standalone villas with plunge pools, a one night stay at this property routinely commands up to $3,000 AUD per night in high season. As a sweetner, room rates include full board – that’s three meals a day, morning and afternoon tea and even room service – plus two activities per day. Find out why this is a property you need to visit! Located just 65 km and around 1 hour’s drive from Dubai, the Al Maha Resort is a high-end Starwood property. It consists of luxury villas with plunge pools nestled within the confines of the Dubai Desert Reserve protected wildlife area. 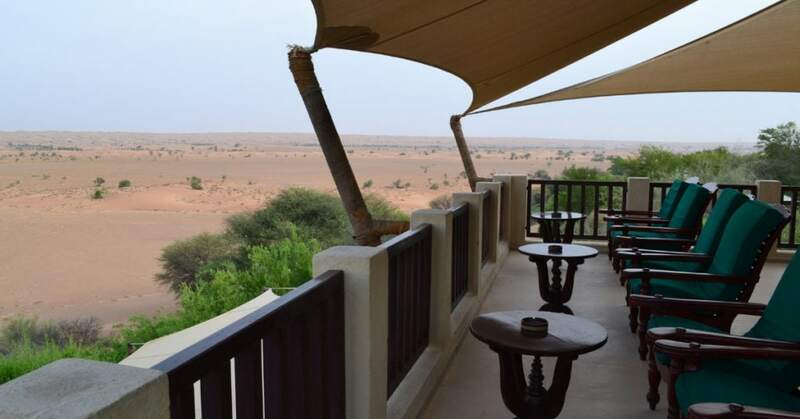 The Al Maha Resort is located approximately one hour’s drive from Dubai within the Dubai Desert Conservation Reserve. My friend and I travelled from downtown Dubai via Uber. You could also travel via taxi or Emirates Chauffeur Drive if you’re lucky enough to be travelling to Dubai in Emirates business or first class on Qantas points (I was able to use Emirates Chauffeur Drive on the way back). 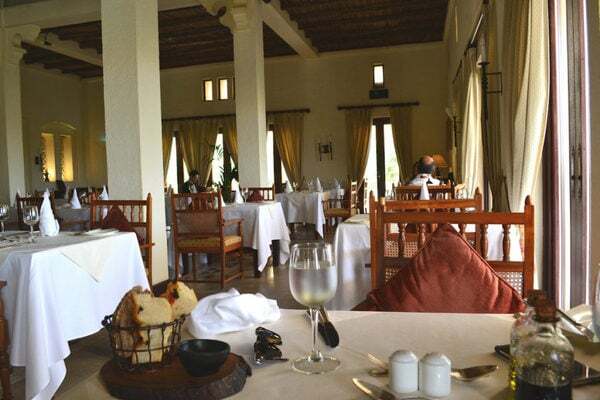 The resort is notoriously difficult to navigate to using GPS, so guests are asked to contact reception via phone half way through the journey in order to access final directions. Once you pass the Al Maha gate, it’s a slow drive for ten kilometres or so until you reach the resort. This final leg of the journey provides a stunning view of the desert, and you’ll be rewarded with the occasional glimpse of the Arabian Oryx, the spear-horned antelope after which ‘Al Maha’ takes its name. 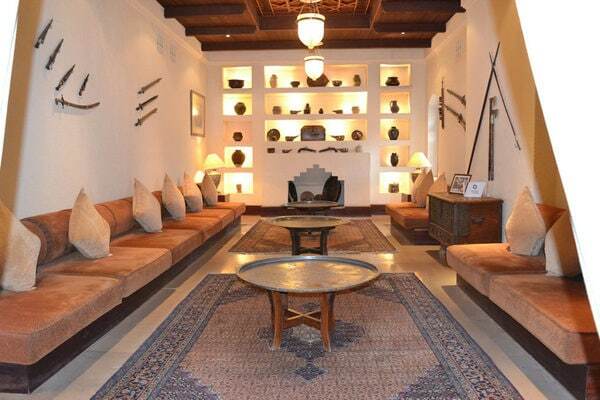 We arrived at the resort at around 11.30 am and were welcomed into the main reception complex which was lavishly decorated with an eclectic mix of Bedouin artefacts and antiques. The vibe felt somewhere between an old Arabian hunting lodge and Raffles. Beyond the main reception complex was a Timeless Spa where guests could arrange for treatments, and a main pool. We were promptly escorted to the guest arrival area, where we enjoyed a refreshing local drink whilst the guest services coordinator, Evalyn, provided us with comprehensive information about our stay. Evalyn advised us that our booking rate entitled us to three meals, plus tea and coffee (but excluding other beverages). 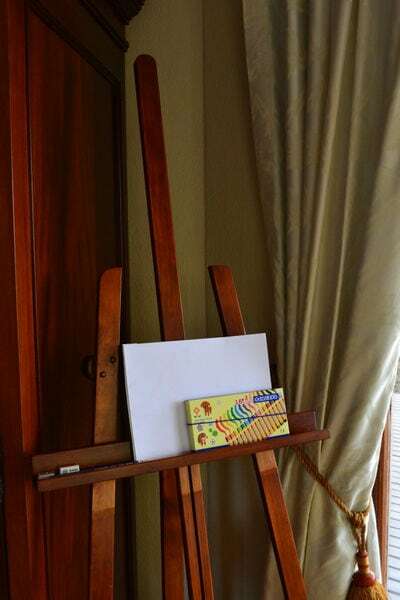 In addition, we’d be able to access an afternoon tea spread from the main lobby, as well as two activities. 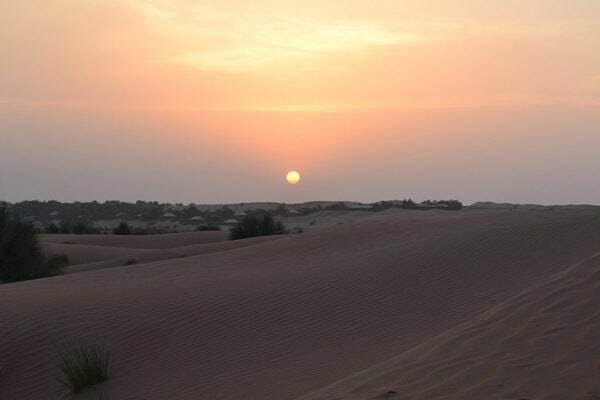 Our choices included archery, camel trekking, falconry and dune bashing. It was clear that we wouldn’t go hungry! Following our orientation, our luggage was loaded onto one of the resort’s buggies, and we were driven to our Bedouin suite, which was ready for an early check in. While I usually try to avoid buggy transport, it’s a welcome mode of travel if you plan to stay in the heat of the Dubai summer, like I did. The entry-level Bedouin suites are actually standalone villas with 75 metres of space. They are sprawled out widely across the resort so as to afford guests the utmost in privacy. The suites are split into a large bedroom / sitting area, with separate bathroom. They offer decks with private plunge pools and an endless view of the desert landscape. 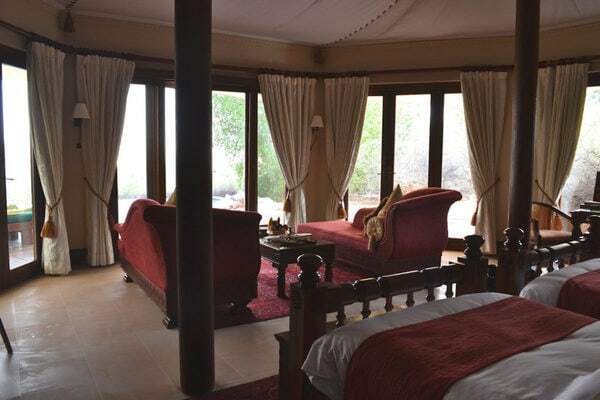 Our octagonal-shaped suite was luxuriously decorated with traditional Arabian furnishings and had a tented ceiling. 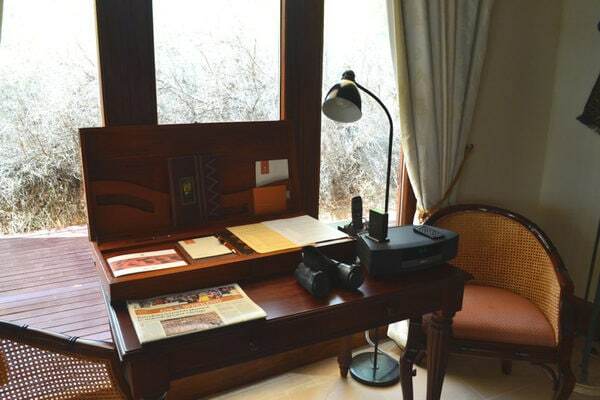 …while a set of binoculars were placed on the writing desk, useful for spotting the abundant wildlife. Still suffering from jetlag, I was heartened to discover that a Nespresso machine was available, with the largest assortment of pods I’d ever seen. 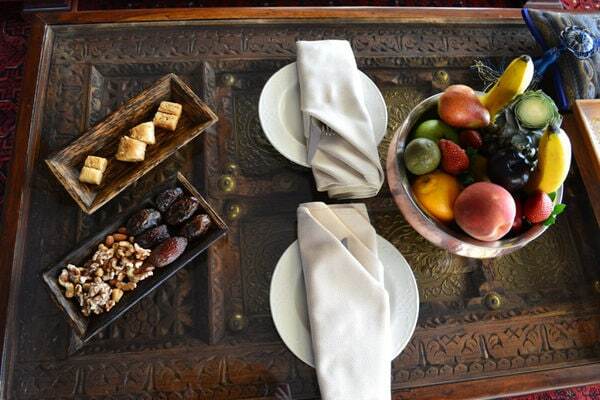 And as I hold SPG Gold status, a welcome amenity of fruit and local Arabian sweets was waiting on our coffee table. 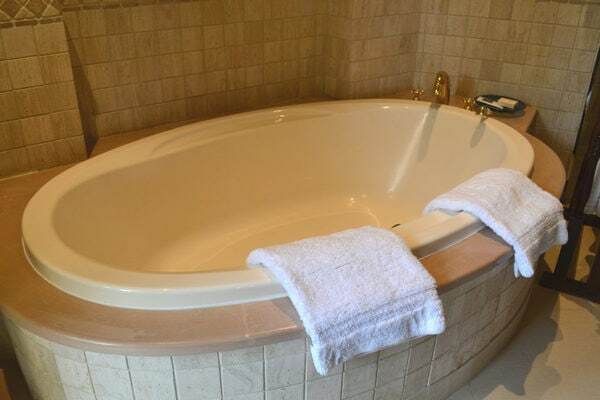 The bathroom featured a deep standalone bath, double vanity, separate shower and toilet. While the decor was arguably getting a little dated, it was still spacious, warmly decorated and incredible luxurious. 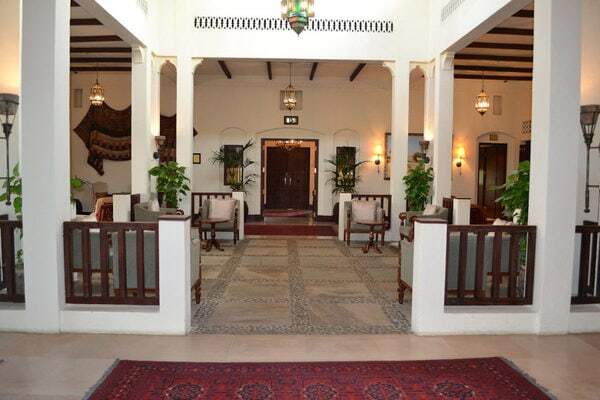 Al Maha is currently undertaking a refurbishment of suites, so I’d expect to see the bathrooms refreshed over time. 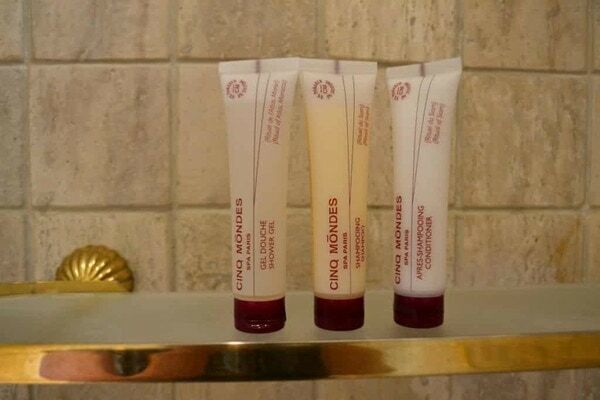 Toiletries were provided by Le Cinque Mondes, a leading Parisien spa brand which I really love. Outside on our private sun deck, the temperature-controlled infinity pool beckoned with views of the desert beyond. As a traveller hailing from a cool Australian winter, I’d had misgivings about staying in the desert in the heat of Dubai’s summer, but a refreshing dip in the pool soon helped to allay any fears. 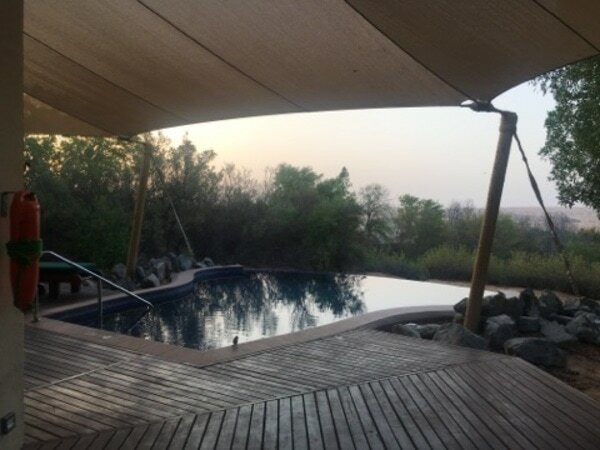 Our private plunge infinity pool – swoonworthy! After an hour spent in the pool and lazing on the deck, it was time to eat as we’d opted to take our lunch at the resort on day one. While we had the option of ordering from the extensive room service menu, we decided to head to the Al Diwaan Organic Fine Dining Restaurant. We called for a buggy, which arrived promptly. 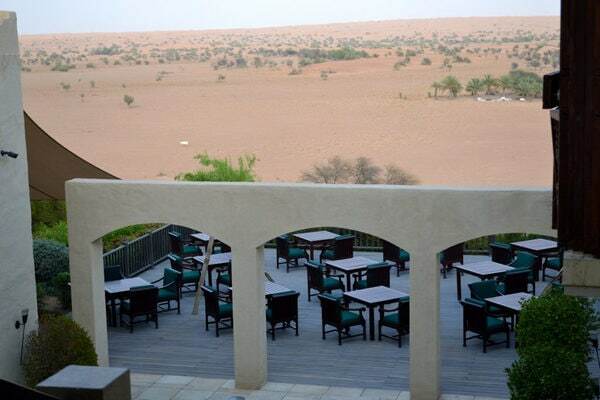 Arriving at the restaurant, we were blown away by the view of the desert from the deck. (If you look closely at the photo below, you’ll spot four snowy-white Arabian Oryxes – one wandering to the left, and three drinking from the waterhole to the top right). Despite the spectacular view, it was far too hot to eat outside, so we wandered inside and resolved to book an outside table for dinner. There were just a few people eating inside the restaurant. Given the heat, we assumed most guests were wisely choosing to spend their day chilling out by their private pool. We were greeted enthusiastically by our waiter and advised that we could choose three courses from the lunch menu. As mentioned above, beverages (apart from tea, coffee and water) are not included in the full board rate, so we decided to take a look at the drinks menu. Whilst we took a look at the menu, a basket of fresh, crusty bread and oil was brought to us. 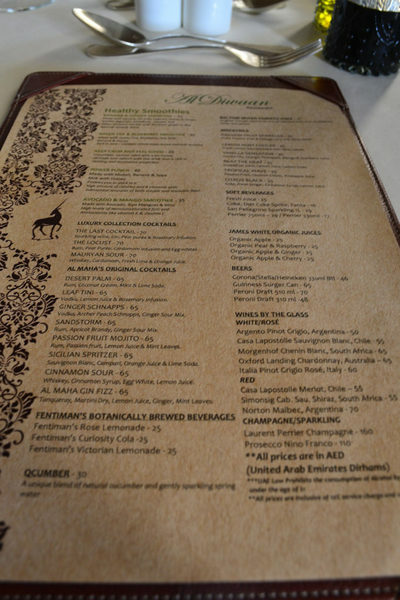 I was pleasantly surprised by the prices – cocktails started at 65 AED with taxes included (around $22 AUD), and a bottle of wine could be purchased from 160 AED (around $56 AUD). We both opted for a refreshing Al Maha Gin Fizz, and settled in to order our food. For my entree, I chose the heirloom tomatoes with burrata, croutons and a balsamic dressing. 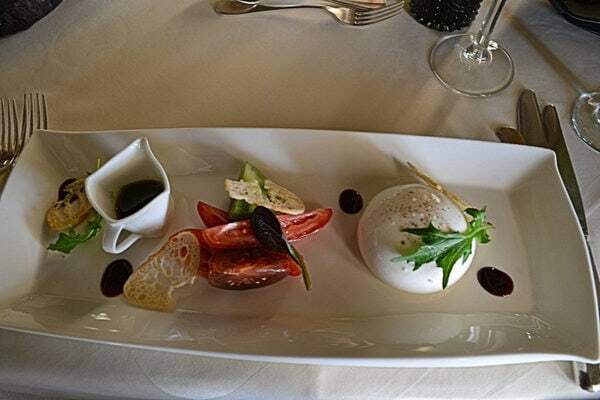 I was sceptical about ordering an Italian style dish in the Dubai desert, but I was blown away by the freshness of the summer tomatoes and the creaminess of the burrata. 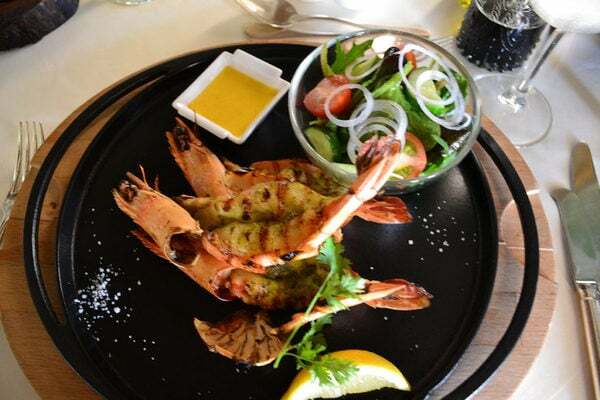 For main course, I chose a simple dish of chargrilled Omani Jumbo prawns with a side salad and lemon dipping sauce. The prawns were enormous and well cooked. By this stage, I was really struggling to find space for dessert. 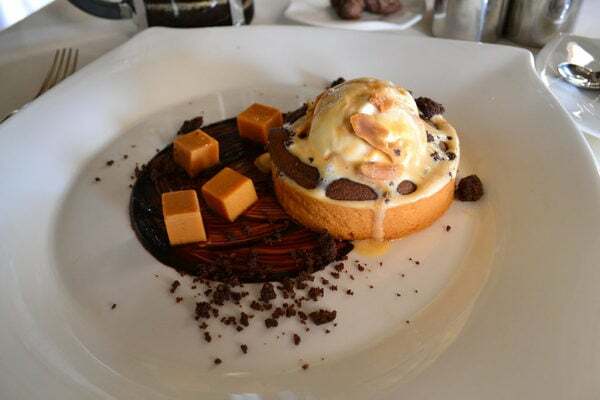 However, I was persuaded to finish off the meal with the chocolate tart with salted caramel and butterscotch ice cream. 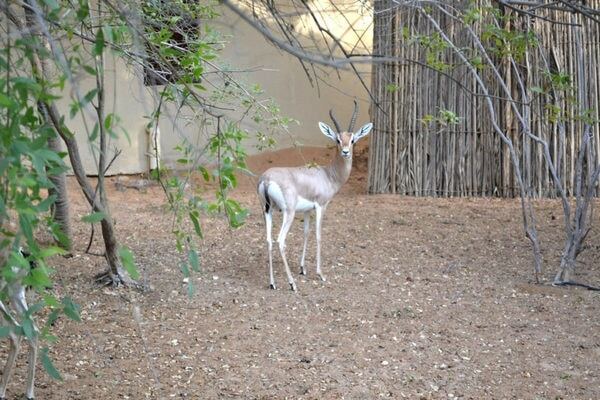 After the meal, we decided to walk back to our villa on foot, meeting a curious gazelle along the way. Each award night entitles guests to two daily complimentary activities which are managed by dedicated field guides. Activities on offer include archery, falconry, dune bashing, ‘Sundowners’ (a drive to watch the sunset) and a Ghaf Tree walk. There are a couple of additional activities available that require a 250 AED supplement, like horse riding. During the summer, most activities run at either sundown or sunset. The approach to booking is very casual, and we were encouraged to simply contact reception when we’d decided on an activity. 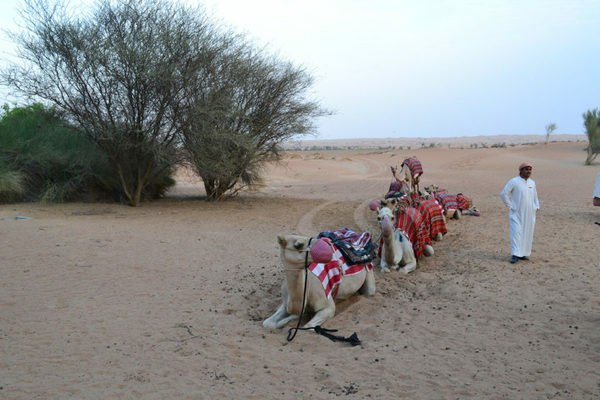 We chose the camel trek for our afternoon activity – a slow guided camel trek to the dune. We’d toast the sunset with a glass of champagne before proceeding back to the resort for dinner. The plan was to then rise early for falconry, which was due to commence at 5.45 am the next day. Guests gather at the lobby prior to afternoon activities, and are met with a huge refreshment spread, including coffees, teas and juices. Nibbles on offer included bite size lemon curd tarts and rare roast beef sandwiches. We were still incredibly full from lunch and anticipating a large dinner, so we only sampled a couple of canapes. Soon, it was time to head down to the front of the resort, where the camel train was waiting. There were around 15-20 guests undertaking the activity, coming from many different countries. Our field guide, Brett, was a former park ranger from South Africa. The trek was great fun, though it was still quite hot. We marvelled at the desert landscape as the camels trekked slowly through the dunes. After around 30 minutes, we arrived at a clearing, where a complimentary drinks stand had been set up. We stopped for around 30 minutes to enjoy a twilight glass of champagne. As we trekked back, we watched the sun sink slowly beneath the dunes. Soon enough, it was time to eat – again! Dinner at Al Maha is an extravagant multi-course affair, and the dress code is lifted to ‘smart casual’. After a quick post trek swim and shower, we wandered down to the restaurant. While it was still quite hot, we were happy to dine outside on the deck, under the stars. After selecting an ice cold bottle of Argentinean Pinot Grigio, the food service commenced. 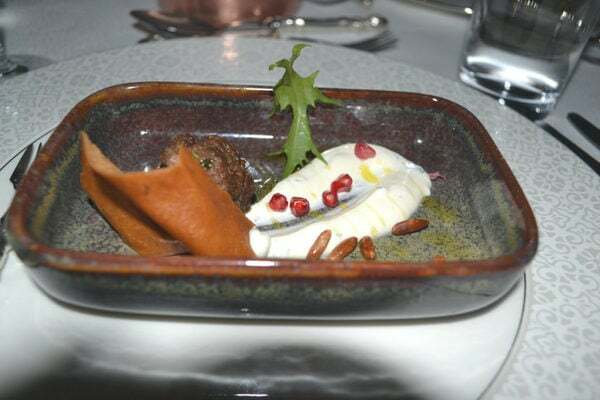 The first course was a flavourful amuse bouche of beef with yoghurt and pomegranate seeds. 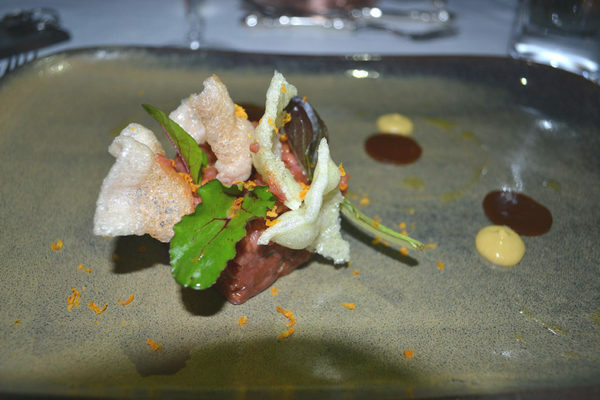 For entree, I chose the Argentinean beef tartare, which was thankfully quite a small portion. 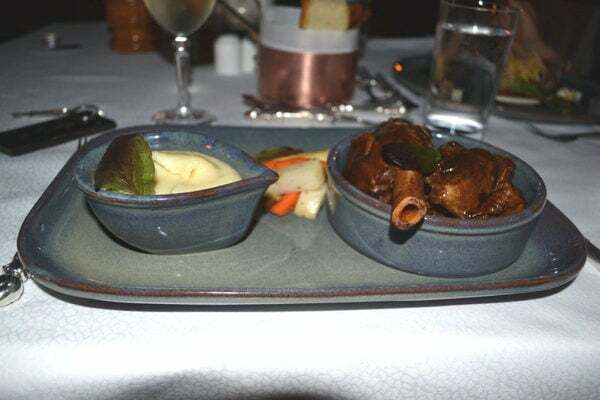 For main course, I chose the slow cooked shank of lamb with vanilla infused potato puree. The lamb was beautifully cooked, and falling off the bone. 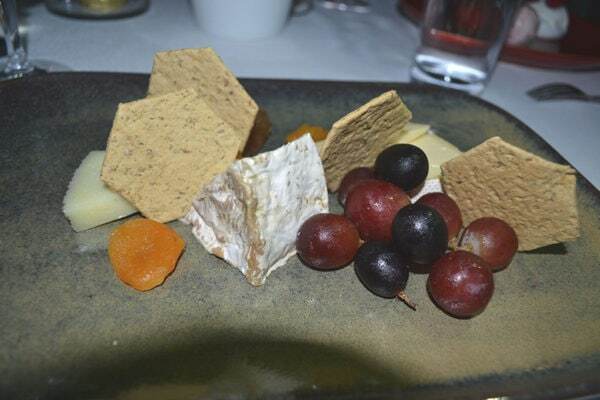 Finally, for dessert, I chose a cheese plate, which featured Brillat Savarin, my favourite triple cream cheese from Normandy. After a wonderful sleep in the comfortable bed, I awoke to find I’d slept through the 5.45 am falconry call – oops! I wasn’t particularly upset though. It provided me with the opportunity for a cool swim before the heat of the day set in. After a morning spent generally lazing around and swimming, we decided to take our final meal in the comfort of our suite, on the deck. A comprehensive room service menu is provided, and you can order whenever you like. As far as I can tell, you can basically order as much as you want from the room service menu. Given our food intake the day before, we’d only been planning to order one dish each, but the friendly guest relations coordinator convinced us to try a few more. Breakfast arrived and was set up silver-service style within around 40 minutes of me placing the order. 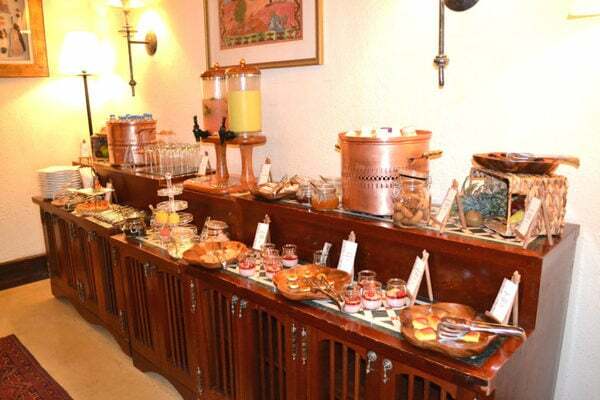 We were treated to fresh juices, waffles, pancakes, Arabian dips and flatbreads, fresh fruits. Condiments including adorable tiny bottles of Tabasco. It was a lovely way to finish off our stay. Soon enough, it was time to depart, with my Emirates First Class Chauffeur booked in to pick us up at 11.30 am. Following a final swim, we booked our last buggy and bade farewell to our desert paradise. 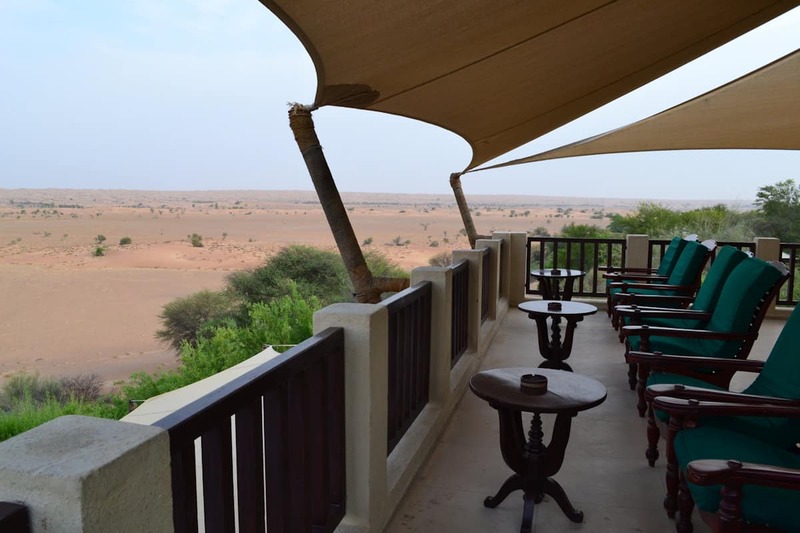 Overall, I really enjoyed my stay at Al Maha, and it was a perfect way for me to enjoy a 24 hour stopover in Dubai. If it’s on your bucket list, I can definitely recommend it! As mentioned above, this property is currently bookable for 60,000 Marriott Rewards points. While this is undeniably a huge splurge for a one night stay, the extra inclusions definitely made it worthwhile for me. 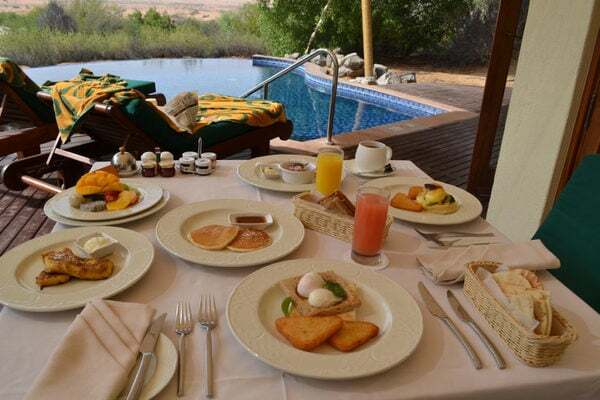 While some reviewers suggest that two nights would be the perfect length of a stay at Al Maha, given the amount of food on offer and the activities available, I actually think one would be enough, particularly if you could arrive early or leave the resort late the next day. The resort seemed to offer flexibility for attendance of morning or evening activities on either day of our stay, and if a suite needed to be vacated, the main pool (which we visited but didn’t photograph) would be a great place to perch in between meals or activities. I should also note that the resort doesn’t accept small children – the minimum age is 10 years. My only recommendation? Visit during Dubai’s winter, if possible. While the private pool provided welcome respite from the searing heat of the summer, it was still incredibly hot when we visited. Staying in the cooler months would open up alternative activities and the ability to spend time outside during the day. Following the recent Marriott and Starwood merger, Marriott Rewards released a new hotel classification chart (which is searchable here). Under the new redemption rates, Al Maha is classified as a Category 8 property. However, until the end of 2018, Marriott is pricing all Category 8 properties price at Category 7 rates, which means a fixed 60,000 points per night. In 2019, the redemption cost will rise to either 85,000 (off peak) or an eye-watering 100,000 points (peak). Australian travellers can acquire Marriott Rewards points through the American Express Membership Rewards program which offers transfers to Starwood Preferred Guest across all AMEX MR schemes (Ascent Premium, Ascent, Gateway and David Jones). Currently, 3 Membership Rewards points convert to the equivalent of 2 Marriott Rewards points. While this is a reduced earn rate (AMEX Membership Rewards points used to convert to the equivalent of 2:3 Marriott Rewards points), there are still good value redemptions to be found with the program – and this is one of them. Why would I want to spend so many points for one night in a resort? To many, 60,000 Marriott Rewards points will seem like an eye-watering number of points to spend on one night’s accommodation, particularly when those points could be spent on a premium cabin airfare. There are no poky hotel rooms in sight. Al Maha is an all-suite property – an entry level room is actually a standalone villa overlooking the desert with a swoom-worthy private plunge pool. Guests receive three decadent meals per day (dinner, breakfast, and the choice of lunch on the first or second day), as well as a generous afternoon tea spread in the lobby (the afternoon tea spread alone puts Raffles high tea to shame – check out my review below to find out more). 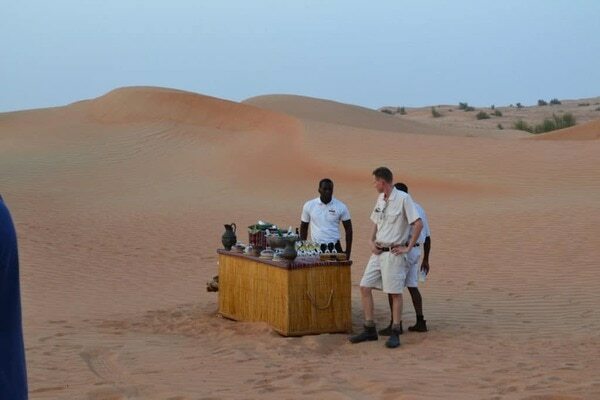 Two complimentary desert activities are offered each day (you can choose from archery, falconry, camel trekking, dune bashing and more). It’s quite accessible to Australian travellers, with direct Emirates flights to Dubai from many cities (plus handy free chauffeur drive, which will get you to the desert).